NOTE: this review is of an old beta. Please see Mozilla Labs for a better description of the program and search addons.mozilla.org to find a more recent version. This APNG editor is a fully functional, easy to use, cross platform program for making animated PNGs. It is currently still a beta, but it does produce valid APNG files. 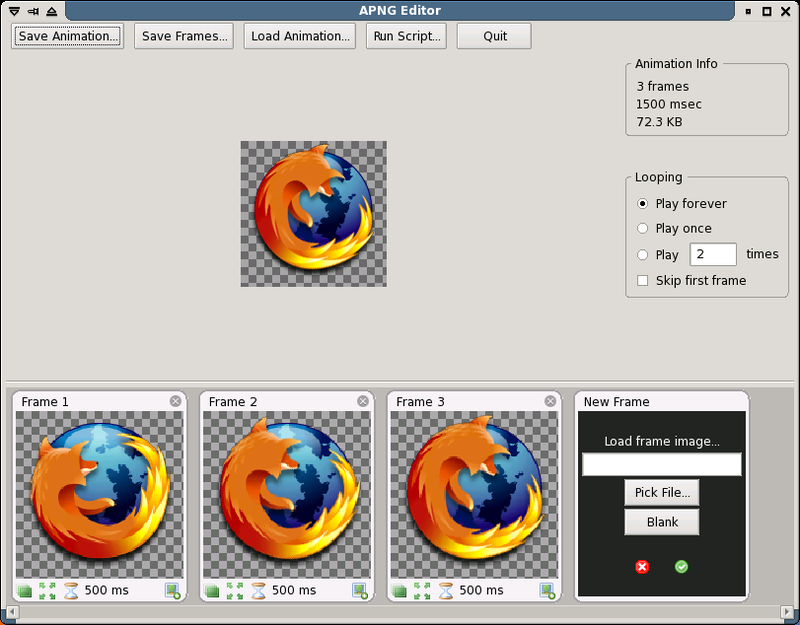 APNG Editor is a Firefox extension. APNG support will only ship with Firefox 3, for now you have to download the alpha version of Firefox. A beta version of APNG Editor (version 0.9) is available from here. If you already have Firefox Alpha 5 or later, just click on the download link above, choose to open it with the Firefox Alpha if it doesn't by default, and in the window that comes up click 'Install Now'. Once the download is complete, install it as you would normally install Firefox. Come back to this page using the Firefox Beta, and install the extension (see first paragraph of 'Installation', just above). After the extension is installed, to start the editor open the Firefox Alpha, go to the 'Tools' menu and there should be an 'APNG Editor' there. Note that Firefox Alpha is a development release and may corrupt your profile. I recommend that you create a new profile to keep your data safe while enjoying the new features of Firefox. If you have something nice to say about the editor, contact Justin. If you want to complain about anything, please contact Andrew.